Spring has arrived 🙂 The cherry trees are blossoming! Now that is beautiful. Makes me wish spring would get here. You can tell spring is here when you see blossom, well you used to be able to anyway. Lots of our blossoms were killed by the hard freeze, but the cherries survived! Whoo hoooo! Sadly, Spring has not yet arrived here in Connecticut but it’s beautiful to see blossoms in other places! All our blooms are gone in California. I so love all these beautiful blooms every year. Thanks for letting me have a look one more time. Beautiful shot! I love the spring and blossoming trees and blooming flowers! oh, so lovely. I just love when they are all in bloom, its like a fairy tale. 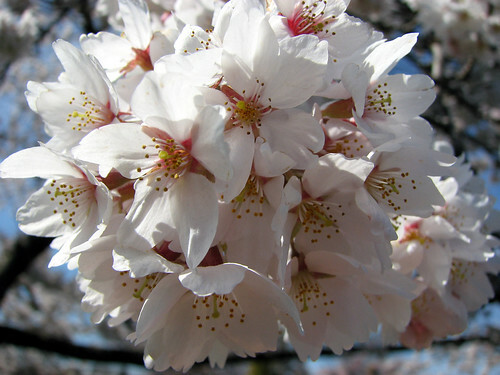 Cherry blossoms are so beautiful. Let’s hope spring is really here to stay! Dont forget to check out the Scavenger Hunt at Amy’s Random Thoughts starting May 1st.Details to be posted tomorrow.SHould be fun!